Click here to see the winners!! Have you ever made your own Halloween costume? Did you take a picture of it? If so, please submit it to my Homemade Halloween costume contest for a chance to win as much as $150! Imagine all the crafting tools or supplies you can buy! I just started a new page on this site with homemade Halloween costume ideas and I need some more projects to fill up the page. So… I decided to run this Halloween contest! What do I mean by being homemade? I simply mean not a purchased costume. I realize you may not be making every single part of the costume yourself. You may have pieced different things together to come up with an entirely original idea. That is fine. It just cannot be a costume out of a bag that you bought or rented. To enter, be sure you first read the Official Contest Rules. Then, simply upload up to four photos of your homemade costume and add in a write-up about the materials you used and how you made it. Be sure you made the costume yourself and that the photo is yours. 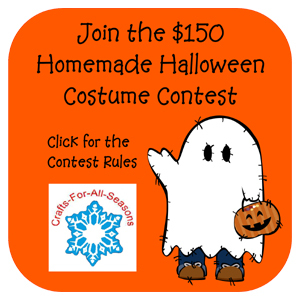 Your costume will appear on the Homemade Halloween costumes page. After you submission is approved, I will also place the photo on the Crafts For All Seasons Facebook page. Tell your friends to come to our page and like your costume, because there is also a prize for your costume having the most Facebook likes! 1. At least one photo (maximum of four) per contest entry is required. Photos must be your own. By submitting your entry you are agreeing for the photo to also be placed not only on the Crafts For All Seasons website, but also the Crafts For All Seasons Facebook page. Please do not submit your costume photos to the Facebook page, as I will do that for you after your entry has been accepted. 2. List of materials used and a step-by-step tutorial on how the costume was made is required. Your write-up must be original and must NOT appear on other websites or blogs. You can blog about your project but please reword your tutorial as Google penalizes sites with the same wordings. Absolutely no duplicate content please. 3. Your entry must be at least 150 words long. 4. Enter as many times as you like. More entries, more chances of winning! 5. Spread the word by placing our contest button on your blog's sidebar and linking it to this contest page. 6. Contest will run from September 5, 2012 to November 5, 2012. Lots of time for you to make your costume and join in! Please take the time to read the full Official Contest Rules for this contest. 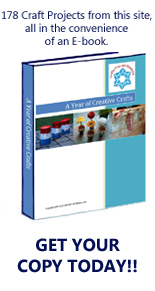 Crafts-For-All-Seasons.com has the right to modify and enhance your submission after the contest ends. This is because each new costume entry becomes its own webpage on this site. Titles and content may have to be modified slightly to enhance for keyword searches for the page, so that other visitors will be able to find the page. 50% Comprehensiveness of Tutorial. The goal of your submission is to become its own complete webpage. Detailed step-by-step instructions would certainly help a lot, and preference will be given to longer written submissions, and those entries which have more than one photo. If you have step by step photos of how the costume was made, that is even better. Each entry must be at least 150 words long. 25% Creativity. If it’s a new and original idea you will get extra points from me! 25% Quality of Photos. Sometimes, all it takes for a person to get inspired is a wonderful photo. Share a good photo of your costume for extra points. I’m so excited to see your ideas and I hope you'll join in on the fun! Ready to submit your costume? Do You Have a Homemade Costume of Your Own You Would Like to Share? Please share a photo of your costume and explain how you made it. Just fill out the rest of this form and follow the help boxes if you need it. Unfortunately I am not able to accept submissions that also appear on other websites. This is because duplicate content is frowned upon by the search engines. If you have shared your costume on other websites, please re-word your tutorial here. Please make sure the photo is your own so I have permission to post it here. Your costume instructions will appear on a Web page exactly the way you enter it here. Begin by telling us what materials are needed to make the costume. Next, describe the step by step instructions to make costume. A minimum of 150 words is required for acceptance. To add your costume photo, click the button and find it on your computer. Then select it. Please resize the photo to 800 x 600 pixels. A picture is required for acceptance. If you are having trouble with this step, please use the contact me form to email me for help. I promise to use it only to send you The Creative Crafter.